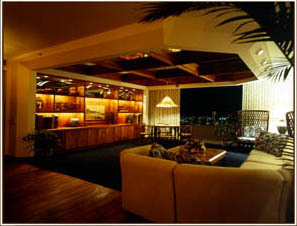 CHILDS RESIDENCE, ROYAL IOLANI. This customized high-rise apartment featured innovative ceiling designs to increase the illusion of height and add drama and interest. the living room ceiling was augmented with what appeared to be structural beams, enclosing a mirrored trellis affect. 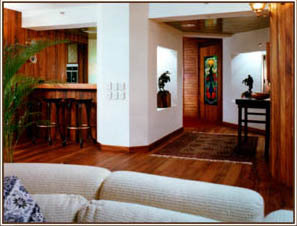 The TV lounge included a treatment of koa wood planking that progressed up the wall, over the ceiling, and was integrated into the cabinetry that housed the recessed television equipment.